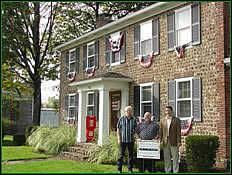 The Webster Village Historical Preservation Commission is proud to announce the Site of the Month for October 2006. The Dean house at 93 West Main St. is a unique example of field stone cobblestone with brick corner quoins. It was built circa 1840. The owner, Greg Chambery, recognizes its importance and takes great care of the building. At present, it houses the office of Hilbert Realty. Pictured with the Site of the Month sign are realtors Chuck Hilbert and Kevin Klem, and former historian Richard Batzing.